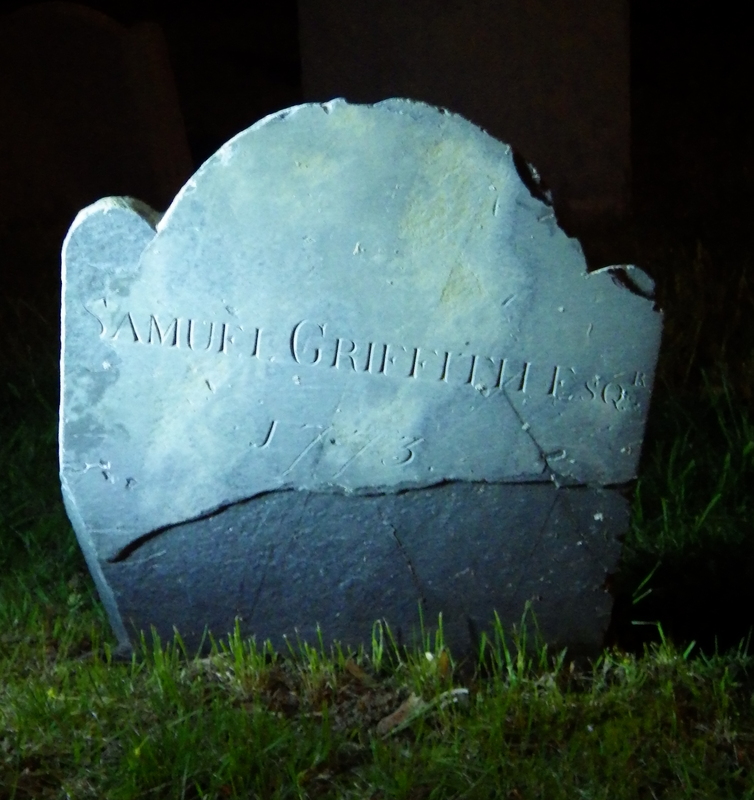 were the children of Samuel and Abigail (Ward) Griffith. They died within days of each other and have a double gravestone. Samuel was the oldest of the two boys. Based on the inscription on the stone, Samuel was born circa May 31, 1755. He died April 21, 1759. Miles Ward, named for his maternal grandfather, was born January 24, 1757. He died just 4 days after his brother on April 25, 1759. There was an epidemic of measles and dysentery in the years of 1758-1759, so that might have been the cause of the boys deaths. 3 Months & 1 Day. *Notice the spelling mistake of Griffeth on the gravestone. 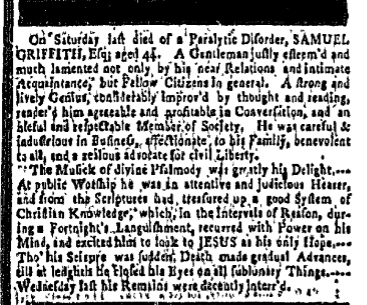 The boys’ father was Samuel Griffith, son of John and Deborah Griffith. He was born in 1729 and died at the age of 44 in 1773. Samuel was a goldsmith by trade and a shopkeeper. It is interesting to see the advertisements of his wares. He was well liked and admired in Portsmouth. He died intestate and insolvent. His estate took over 30 years to settle through Probate. 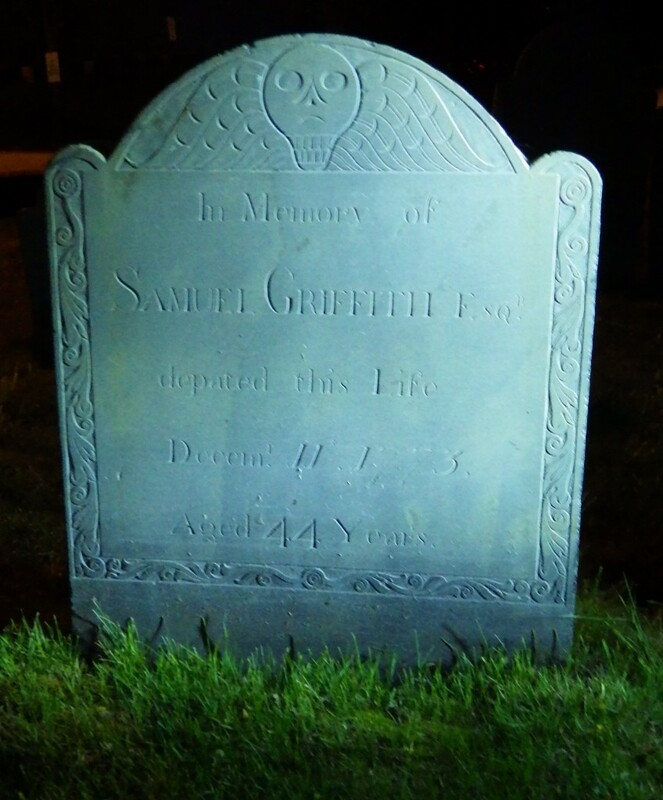 On Saturday last died of a Paralytic Disorder, SAMUEL GRIFFITH, Esq. aged 44. A Gentleman fully esteem'd and much lamented not only by his Relations and intimate Acquaintances, but Fellow Citizens In general. A strong and lively Genius, considerably improv'd by thought and reading, rendered him agreeable and profitable in Conversation, and an able and respectable Member of Society. He was careful & industrious in Business, affectionate to his Family, benevolent to all, and a zealous advocate for civil Liberty. Tho' his Seizure was sudden, Death made gradual Advances, till at ______ he ____ his Eyes on all ____ Things. Wednesday lst his Remains were decently Interr'd. Samuel is buried in the Point of Graves next to his children. 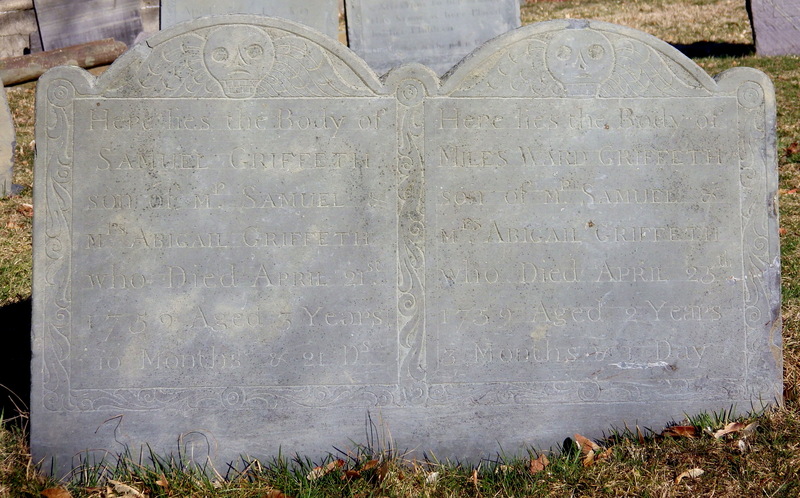 Samuel married Abigail Ward December 7, 1752. 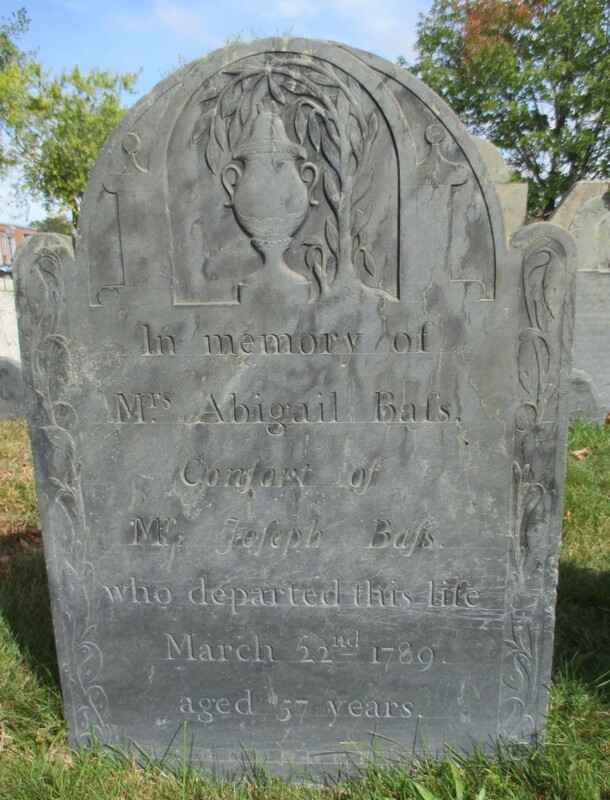 Abigail, born in 1732, was the daughter of Miles Ward and Sarah Massey Ward. She married Joseph Bass after Samuel died. 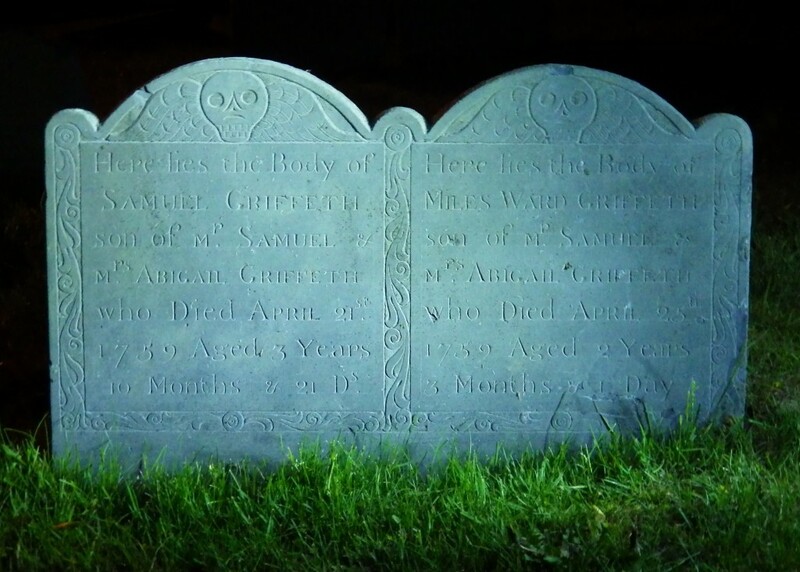 She died March 22, 1789 and is buried in the North Cemetery, Portsmouth, New Hampshire. photo taken by June S.